Rayon is a man-made redeveloped cellulose fiber. Rayon is produced from naturally occurring polymers; it may be a really artificial fiber or completely a natural fiber…..
Rayon is a semi-synthetic or artificial fiber. Rayon is recognized by the name viscose rayon and art silk in the textile industry. Rayon fibre is a synthetic textile material which is fully the collection of cellulose acquired from cotton linters or from the soft tissue of trees such as spruce. Rayon was introduced in the year 1900 approximately, since it has been used in several textile fields. Very first rayon was called artificial silk because it is in filament form and somewhat resembles like silk material. However, this similarity is deceptive because the chemical composition of rayon is totally varied from the chemical composition of silk fibres. • Rayon is very soft, cool comfortable and very good absorbent property but could not be able to protect body heat and used in humid steamy climatic conditions. • Rayon fibre has the same comfort property as natural fibres. 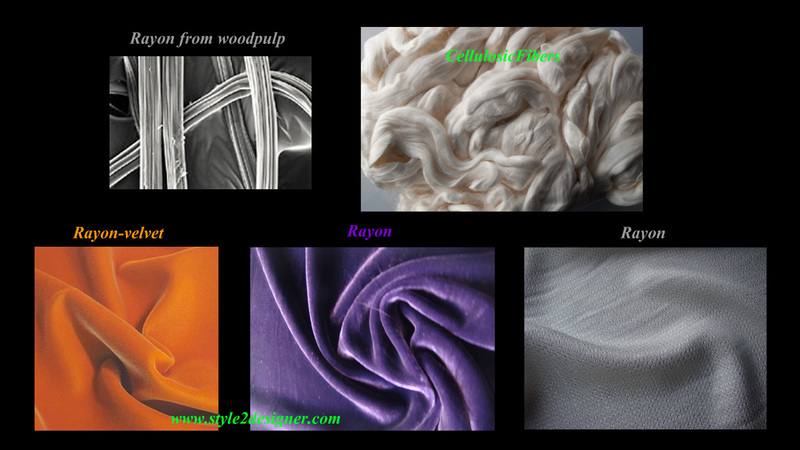 • Rayon can replicate the feel and texture of silk, cotton, linen and wool. • Rayon has very lower elastic recovery of any fibre. • HWM rayon is very stronger and reveals good durability. HWM rayon can be machine washed. • Usual rayon fibres recommended care for dry cleaning purpose only. Rayon is a major feedstock in the manufacture of carbon fibre. Grasim of India is the major producer of rayon in the world which is claiming 24% market share. Modal and Tencel fibres are generally used varieties of rayon which is produced by Lenzing AG, based in northern Austria. Lyocell is the common name for Tencel which is made by a little various solvent revival procedures, and is well thought-out a different fiber by the United States FTC. Its is very informative and useful….. Thank you Madhu. Happy to be useful with this content of fibres. Aliaozakm-infarmataon found, problem solved, thanks! Acrylic is also used in artificial wool by combining it wid nylon…to make it strong. Thx this rlly helped with my science project ?